Description: Reflects the rich, exotic heritage of India. Made with handcrafted silken luster loops contrasted with a matte finish cut pile yarn combination. Subtle pattern of vines and leaves are remeniscent of decorative tile mosiacs. Kashmir’s 31 colors range from pale neutrals to honey and bronze earthtones. 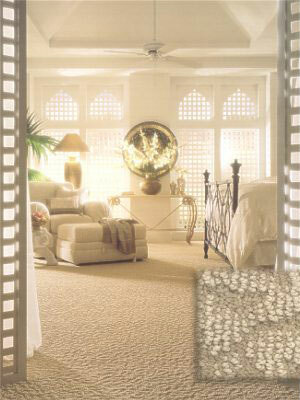 Kashmir is available in both Masland’s broadloom and area rug programs. Available in Residential Broadloom only. Made of DuPont Antron® Legacy.